Tuesday 9/5/17: My friend Ed Newby and his lovely wife Sarah Newby lost so much this past week due to hurricane Harvey. I know they are one of many here in H-town who are in the same horrible predicament, but I still feel led to share this with y'all today. I know Ed because he is my air conditioning guy. One week while Chuck was out of town, he came to Momba's and my rescue in 100 degree Texas heat. (Why does a/c always decide to die on the hottest days?). Anyway, in less than a day, Ed had obtained the unique part we needed for repair and had us running smoothly, comfortably, quickly and at a reasonable cost. I also know Ed because he is the President of a wonderful non-profit here in Houston called Operation Snowstorm. Operation Snowstorm provides children battling terminal cancer the rare opportunity to experience the miracle of a snowstorm in Houston. Ed and his team do this by dropping 10,000 pounds of snow - providing gloves, toys, shovels and even snow sleds for sweet "Snow Warrior's” to escape cancer and enjoy just being a kid for a day. Seriously....Priceless!!! This gives these kids and their family and friends the opportunity to gather together and create treasured memories which are captured by a professional photographer and given as keepsakes to remember their special snow day. (Some of my dear friends lost their sweet grandson to cancer and I can assure you that Ed's ministry made a lasting impression to them all.) Mind you, both Ed and Sarah do this because they can, btw. No profits or agendas.... They just want to make these kids, who have been through so much, smile. Ed told me once that he couldn't change the world, but he could make snow... and that's exactly what he does. Snow that blesses!!! There is no way I can tell you in a short post how much I love and respect Ed and Sarah Newby. They are walking love. They visibly wear Jesus throughout their whole life. This past week Ed, Sarah, and their children evacuated from their home when flood waters began to engulf their street. Once they reached shelter, they bravely rallied with other neighbors to insure safe rescues for the rest of their community. 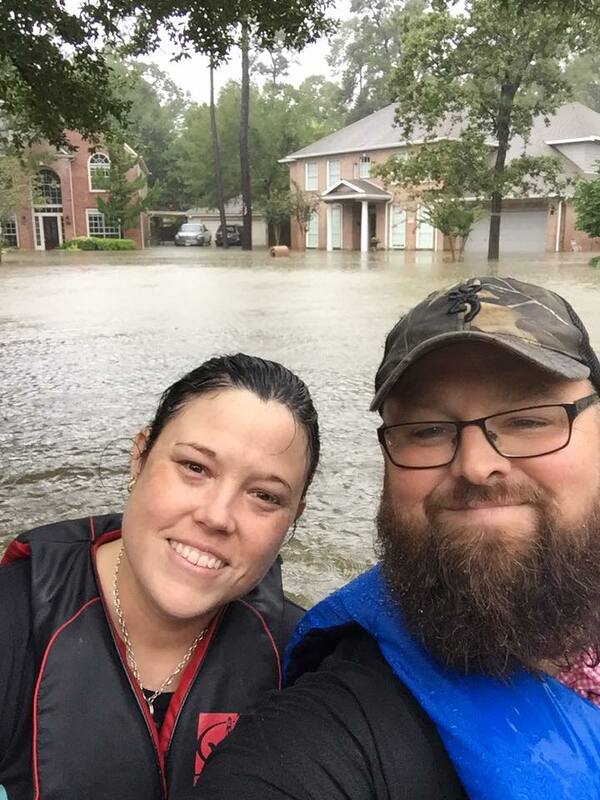 As their own home remained underwater and inaccessible, Ed and Sarah served by helping others any way they could. Heroes, plain and simple. Since returning to assess and address their own flood damage, Ed and Sarah still have made time to advocate on behalf of fighting childhood cancer. They have helped flood victims find a hot meal. They have served and served and served in more ways than I can type. When Chuck couldn't get our a/c running after the power returned in our home this week, we called Ed. Of course, Ed offered to drop all he is currently dealing with to come help us with our not-nearly as important problem. Fortunately, that wasn't necessary and they were able to figure it all out via telephone... at no charge, mind you. Sooooo soooo generous and sweet. I could go on and on about the Newby Family. But I'm more inclined to paint this small picture of their wonderfulness and simply ask all my friends and family if y'all could pray for them as they are really struggling to get back on their feet. If you or your church would like to help the Newby family directly, shoot me a private message and I will help you get connected with either Ed or Sarah. Let's love on these heroes, shall we? Let's give back to those who have selflessly continued to give all of themselves, making our world a little brighter in Christ's love. Thanks all for your support and God bless!!! PS.... please share if you feel led.